Have you heard of Tot Wraps?? 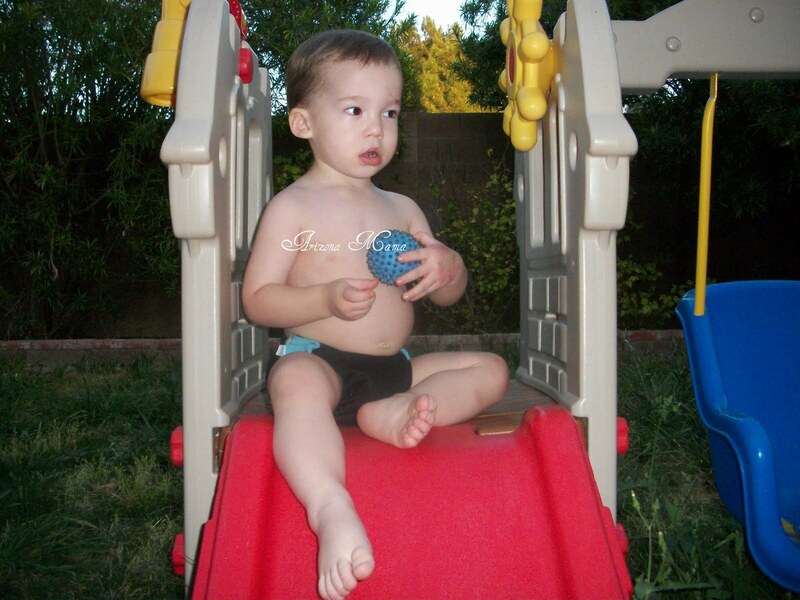 Tot Wraps is a whole line of cloth diapers and more made by WAHM's. Krysta is the owner of Tot Wraps™ and the designer of all the Tot Wraps™ products. Krysta is a WAHM that also home schools her 5 children. Krysta has a few work at home mama's that help her with the Tots Wrap line, but she has a little hand in every item made. I have a couple of the Tot Wraps Dream Diaper AIO OS diapers and I love them. They are as they are called "dream diapers". So easy to use and fit great. 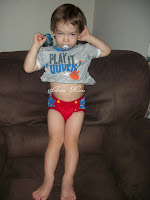 So of course now that I am potty training I thought of tot wraps and their training pants. They have 2 types of trainers, the transition trainers and the dream trainer. I was so happy when I heard that I would be able to try and review the transition trainer. These are so cute! I received mine in the mail and it is a super cute car print (One Way) in red. *Available in a full range of sizes from 12 months to 5T. *Waterproof polyester PUL center panel to keep wetness contained. *Absorbent enough to catch accidents yet thin enough to fit under clothing, even jeans. Using Zorb™ for the soaker pad maximizes absorbency. *Soft cotton interlock inner fabric and side panels in stylish prints. Your child will feel the wetness of their accident. *Easily pull up and down so your child can use the potty all by themselves. *Snap opening for easy changes and no need to undress to put a new trainer on. We tried on the transition trainer and it fit perfect. It was adorable. Jayden liked it to. He was pointing out all the different cars, trucks, and bus. It is of course the beginning stages of potty training so I am expecting lots of accidents. The first time we used this trainer Jayden tells me, "I go potty." so I of course hurry him to the bathroom to go potty, but he already went. To my delight he did not leak or drip at all. He was able to tell immediately that he was wet, but did not leak on my carpet. As he sat on the potty he looked at his transition trainers and said, "Oh no! Bus wet, car wet, Oh no!" He was sad that his new trainers were wet and he could not wear them anymore. We tried it again during an afternoon nap. Of course Jayden refused to use the potty before nap so this would be a good test. Jayden woke up and his trainer was wet, but the bed was DRY! The trainer held up.. it was definitely full and needed to be off now and Jayden knew it too, but it was not dripping or in the bed. I really like this trainer. It is really cute and fits great. I like the snaps in case of messy accidents. I like that Jayden can feel right away that he is wet, but didn't drip or puddle all over my carpet when he was wet. I really don't have anything I don't like about this trainer except maybe that I don't have like 5 more of them. LOL! Buy It: Tot Wraps Transition Trainers are $12.95 and come in a variety of cute prints. Mandatory Entry: For this giveaway you MUST follow my blog publicly and then go to Tot Wraps and tell me what print transition trainer you like or what other item you would like to try. I was provided a Tot Wraps Transition Trainer to help with my review. I was not compensated in any other way for this review. All opinions expressed are my own. Thank you to Tot Wraps for the Trainer and the giveaway to my readers. I like the Bugs and Butterflies trainers. I follow your blog. I love the fruit and flower print. I follow the mommy times. I like the One Way Transition Trainer in a 3T for my son and also the Dream Diaper™ OS Hybrid AIO in Lavender for my baby girl. My son would like any of them since the boy prints are mostly animals and cars, but he would probably like the Fire! the best. I like the zoo print. I follow Tot Wraps on twitter. I follow The Mommy Times via GFC. I follow Happily Southern via GFC. I'm following you publicly with GFC. I love the print and color you reviewed and also the Zoo print/yellow trainer. I'd also love to try the Dream Diaper OS AIO or even the Dream Trainer for night-time. Thanks! I've really been admiring these trainers for a while now! I follow you and I love the Firetruck trainer's!! Adorable!! I follow the Jacobsen Blog. I'd love the Zoo print trainer! All the patterns are cute. Would love to win this for my granddaughter who is using Pampers Easy Ups while she is potty training. I love the aqua and lavender color! I follow your blog, and I would choose the I Am Sleepy Transition Trainer. I subscribe via email - entry 1. I subscribe via email - entry 2. I subscribe via email - entry 3. I follow the Mommy Times on GFC. I follow Happily Southern on GFC. I entered the Mother-Ease giveaway. I follow blog. Love transition trainer fire pattern. I entered your Anytime Costumes giveaway! I follow and I like the One Way in red. Too cute! My son would love the "Fire!" pattern!